We want to be your partner in your journey. That is why we provide you with the necessary information to get an overview of what Angel Care can offer. How do you pay for home care services? Coverage may vary, and we encourage you to contact your coverage provider or our office, and we will assist you in determining your benefits coverage. Our office is open from 9:00 am – 6:00 pm Monday through Friday. We have staff on call 24 hours to assist with any concerns. We’re ready to help. Call us at 781-281-7485 or 888-98-ANGEL (26435). All nurses and therapists who visit your home go through a rigorous interview and screening process, as well as background checks and license verification. Our caregivers are regularly supervised and evaluated to ensure that you or your loved one is receiving the care and attention they deserve. To submit an online request to Frances Health Services, please contact us at 781-281-7485. We will come to your home to complete an assessment, and our clinical team will discuss a plan of care with your primary physician. “Unskilled” or “Non-medical” care typically refers to companion and personal care activities such as bathing, grooming, dressing, as well as assistance with meal preparation, light housekeeping, and running errands. It could also include medication reminders, assistance with ambulation, and transportation to medical appointments. These types of services are typically provided by Home Health Aides (HHAs) or Certified Nursing Assistants (CNAs) and can be arranged for anytime – from a few hours to 24-hours a day. “Unskilled” or “Non-medical” care is often sought by the elderly, new and expectant parents, individuals with disabilities, and those transitioning from a hospital or medical facility to home. 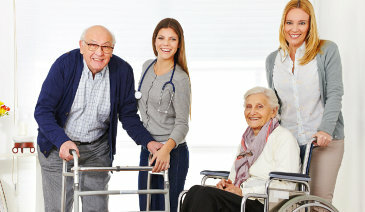 “Skilled” medical care follows a specific plan of care under the supervision of a Physician, Nurse (RN/LPN/LVN), or Therapist, and involves home healthcare services such as nursing care, physical, occupational, speech, and respiratory therapies, as well as social services and hospice care. Skilled medical care at home can help provide a comforting solution to residing in a hospital, nursing home, or assisted living community. Yes. We can provide services up to 24 hours a day, and there is always a local on-call manager who can answer your questions and address any concerns after hours. The on-call manager also provides around-the-clock clinical support for your healthcare team while they are providing care in the home.